Firstly, let me wish all the moms out there a very Happy Mother's Day! Below is my card for the Curtain Call May 1 challenge. 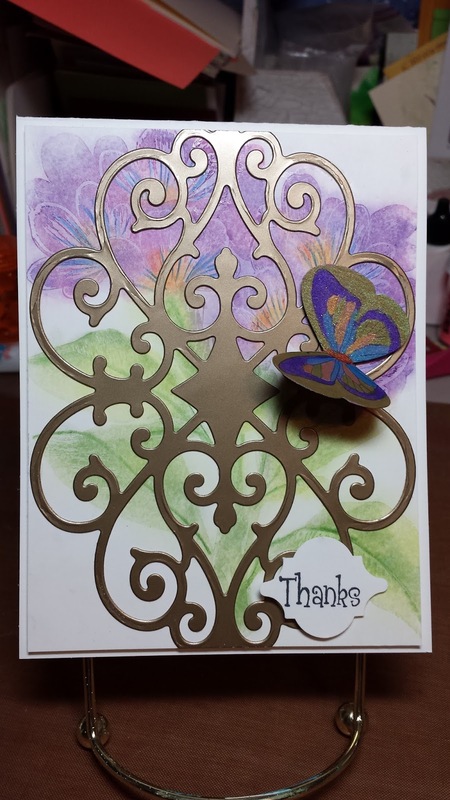 My card was created using the Sweet Floral stamp from Stampin' Up! I stamped the image with Versa Mark and used Pan Pastels to smudge the colors. On top I place a die cut in shiny gold. 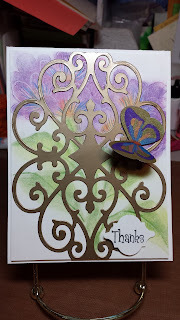 I stamped the butterfly and colored it with my ColourArts Silks acrylic paints. Then went over it with my Wink of Stella. I love this clean and simple card! If I'd have left the sentiment off, this would have been a perfect Mother's Day card! Hope you have a blessed Mother's Day. Great die cutting and cutee butterfly..